Switch to our new Hotel Tuscany Prategiano website ! 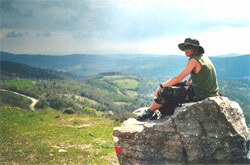 During your walking tours in Tuscany you will discover an untouched and “wild“ region of Italy. Most of the treks follow easy to walk trails, some on gravel road, some through thick vegetation and some over fields and through woods without proper paths. We recommend waterproof trekking shoes for crossing small rivers. On most tours you can also go only half way and meet us for a midday picnic and a lift back to the hotel. This flexibility makes the treks suitable for all hikers, including those with minimum fitness. On this unique tour we walk downhill along paths, which were used by the miners in former centuries, travelling through chestnut and oak trees woods where we will discover ancient. A unique and bizarre landscape of “red mountains” is waiting for us at the end of the tour. After visiting the picturesque medieval village of Gerfalco we walk up a small path to the ridge of the „Cornate“. During most of the tour we have a nice view to the coast and the island of Elba. We pass by a former famous quarry of marble, which provided the marble for the Cathedral of Siena. Wednesday: Day off: Proposal for an excursion by your car or by our minibus: Trekking in the Natural Park „Scarlino“, relaxing at one of the most beautiful beaches of Tuscany, “Cala Violina“, and a visit to Massa Marittima. The path leads uphill through a chestnut wood to the first view point, where we will enjoy a fantastic view towards Siena and the coast around Grosseto. Rough, unspoilt and mountainous landscapes and breathtaking views are the highlights of this trekking. Friday: Day off: Proposal: Excursion to Siena with public bus or participation on picnic excursion to the river Merse with a visit to the monastery of San Galgano. We walk from Montieri downhill to the chapel “Madonna dei Castani”. In the valley the landscape changes from woods to meadows, which are used for extensive herding and we start our uphill climb to the “Monte Murlo”. valleys. Would you like to receive further information or do you want to book a room in our hotel? Please write (reception@hotel-toscana-tuscany.com) or call us (0039 0566 997700) ! We will be glad to help you.